We follow the story of Eric, thee Huntsman (Chris Hemsworth) as a child turned into a soldier. He has a love interest with Sara (Jessica Chastain) another Huntsman, but Freya does not allow any sort of love in her kingdom. When the Ice Queen discovers this budding love, she has the pair punished and Eric is left for dead. Years pass and Eric is asked to find the mirror that helped Ravenna (Charlize Theron) rise to power and hide it once and for all. Freya gets a whiff of what's going on and wants the mirror for herself. As Ravenna's younger sister, she hopes to gain the same power. Eric sets out after the mirror with dwarves, Nion (Nick Frost), Gryff (Rob Brydon) and later meets two more: Mrs. Bromwyn (Sheridan Smith), and Doreena (Alexandra Roach), in addition to an old friend. They are a lively group and had great comedic chemistry. Even though the mission itself was serious they kept it fun for everyone. There is a lot of adventure in the Huntsman with dashes of comedy and of course plenty of action. You get to see why Queen Freya is so cold and you might just see Ravenna return, but as something else. I liked the storyline and when I thought there was plot holes early in the film, they were later answered. The scenery of this fantasy genre was also eye moving. I liked the chemistry Jessica and Chris had and if it is possible I wouldn't mind a third installment. 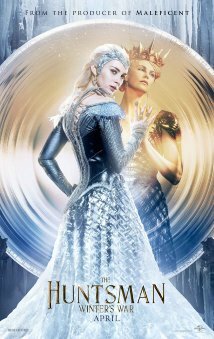 Emily Blunt and Charlize Theron are both gorgeous and played the part as evil queens marvelously. Worth the watch, even if you didn't see the first one.